Discover the best restaurants with the Luxury Restaurant Guide free app and club. Indian Accent London follows in the footsteps of its multi award-winning outposts in New Delhi and New York. It offers an inventive approach to Indian cuisine where Chef Manish Mehrotra reinterprets nostalgic Indian dishes. Set across two floors, it is a leading destination for modern Indian food in a contemporary and stylish setting. Indian Accent in New Delhi has won several awards and global recognition, including being the only restaurant from India on the World’s 50 Best list in 2015, 2016, 2017, and being awarded the San Pellegrino Best Restaurant in India on Asia’s 50 Best list for each of those years. Hovarda comes from the Good Food Society (same stable as Yosma, Frescobaldi London and Firenze) and is a new Aegean-inspired bar and restaurant. It has a colour palette of sea green and blue, bringing the spirit of the Aegean together with wood panelling, rich fabrics, ceramic murals and an impressive chandelier centerpiece. The bar area maintains a laid-back vibe in the afternoon, before the in-house DJ takes control in the evening to liven things up and live music on Sundays. The menu focusing on dishes inspired by the countries surrounding the Aegean Sea with a strong emphasis on seafood. Sections of the menu include raw, as well as hot and cold meze. The fish menu changes daily depending on what the fishermen have caught from around the British Isles. Please see the Luxury Restaurant Guide. With a complete refurbishment, including restaurant, a private dining room and bar seating, the team behind The Square look to usher in a new era of epicurean excellence encapsulating the best food, wine, service and design at this iconic Mayfair location. Drawing influence from Mayfair’s art galleries, the new concept by Virgile & Partners, reflects an urban and minimalist aesthetic, underpinned by an elegant and timeless style. The main dining area is a perfect square with parquet flooring and square glass blocks used in both the external windows and internal walls, allowing natural light to penetrate the space. Please see the Luxury Restaurant Club offer available at The Square and other MARC restaurants, Morton’s and The Greenhouse. Duddell’s opened its first restaurant outside of Hong Kong. Based in St Thomas’ Church in London Bridge on the doorstep of The Shard, it offers a more relaxed take on Cantonese cuisine. Featuring both recognized and re-interpreted classics as well as Duddell’s signature dim sum symphony which is more delicate and intricate than traditional dim sum, showcasing the team’s folding prowess. Heading up the kitchen is Chef Daren Liew who was previously Executive Sous Chef with the Hakkasan Group and comes with over 20 years of experience in Cantonese cuisine. Like the Hong Kong Central original, Duddell’s London will be a multi-functional venue playing host to many cultural events, striving to provide an inspiring backdrop of art with regularly changing exhibitions of museum-quality works. Please see the Luxury Restaurant Guide. Sorrel is the first solo project from Steve Drake, one of the country’s most talented chefs with 25 years experience in some of Europe’s best restaurants. His most recent tenure was at Drakes in Ripley where he held a Michelin star for 14 years. His hopes are that Sorrel will be ‘one of the best in the country’. Please see the Luxury Restaurant Guide. The Barn is the second dining room at Moor Hall Restaurant with Rooms in Aughton. It features an informal 65 seat dining room on the first floor of the converted building adjacent to the main manor house. The interior design features original beams and rustic brickwork, an open kitchen and integral bar. Please see the Luxury Restaurant Guide. Cinnamon Kitchen Oxford opened in Westgate Centre, a new retail and leisure destination in Oxford and offers a relaxed all-day dining concept. Like its sister restaurant in London, Cinnamon Kitchen Oxford serves modern-Indian cuisine with British influences using innovative cooking techniques. The restaurant also boasts a roof top terrace with great views of Oxford Spires. The bar is the focal point of the room and an open-plan kitchen lets diners view the cooking action. Please see Luxury Restaurant Club offer available with the Cinnamon Kitchen group. At the Four Seasons Hotel Hampshire, the Wild Carrot is named after the dainty white wildflower found plentifully in its fields at Dogmersfield Park. The restaurant has been created under the helm of acclaimed designer Martin Brudnizki, in an distinctively British design. Offering rolling countryside views framed by beautifully large floor to ceiling windows, the spacious dining room exudes a stylish yet unpretentious and relaxed feel. Enjoy traditional dishes with a contemporary twist, such as the sharing beef Wellington served with rich mushroom duxelle, cabbage and truffle sauce. Please see Luxury Restaurant Club offer available at the Wild Carrot and Four Seasons Hotel. Martha Ortiz, Chef Patron of Mexico City’s award-winning Dulce Patria, heralded as one of Latin America’s most exciting restaurants, states ‘we will deliver the beauty, vibrancy, and spirit of Mexico to London in a total experience of the senses.’ Martha’s philosophy has been brought to life by David Collins Studio, the global interior architecture practice led by Creative Director Simon Rawlings. The restaurant features references to Mexican design and culture. Please see the Luxury Restaurant Guide. An elegant but relaxed Notting Hill restaurant with cocktail bar. This is the first solo venture from the eponymous Antrim-born chef. Trained under Gordon Ramsay and Alain Ducasse, the restaurant promises a fine-dining experience that places an emphasis on sustainability and celebrates British produce. Please see the Luxury Restaurant Guide. The former Surrey home of media magnate and politician Lord Beaverbrook opened its Japanese restaurant, The House, its fine dining offering. It joins alongside The Garden House which opened earlier in October 2016 as part of a multi-million transformation into a Grade II listed five star hotel, spa and golf club. Please see the Luxury Restaurant Guide. This 16th century coaching inn launched its new dining experience, Lygon Bar & Grill. Designed by leading interior designer, Anita Rosato, as a ‘home away from home’ relaxed and inviting ambiance, with a design palette comprising tweed, leather, dark woods and antique pieces, which echo the quintessential Cotswolds. The menus are carefully crafted using locally sourced, fresh produce offering seasonal British all day menus. Please see Luxury Restaurant Club offer at The Lygon Arms and other Iconic Hotels, Cliveden, Chewton Glen and Cadogan Gardens Hotel. Created by world-renowned chef Jean-Georges Vongerichten, it overlooks fashionable Mount Street, in the heart of Mayfair, and offers informal gourmet dining, all-hours, in a relaxed, contemporary setting. Breakfast, lunch, afternoon tea and dinner are all served here, along with a carefully-curated menu of tasty cocktails; and the extensive wine list is drawn from The Connaught’s 6,000-bottle cellar. The menu is eclectic and imaginative inspired both by Jean-Georges’ experiences of the Far East and his signature use of south-east Asian flavours, whilst also featuring his distinctive take on British and Connaught classics. Please see the Luxury Restaurant Guide. Coming from the team behind Hackney’s Pidgin, Magpie is a contemporary British dining restaurant with an open kitchen serving sharing-style plates from trolleys and trays, dim-sum style. Larger format dishes can be ordered from the kitchen, as can desserts. Please see the Luxury Restaurant Guide. Mei Ume is an exciting new Asian dining venue, designed to complement and diversify the Hotel’s existing food and beverage offering. Introducing a menu of authentic dishes from China and Japan with a modern approach. Vibrant and fast-paced, the restaurant includes bar, lounge and table seating, as well as a private dining room for up to 14. Please see Luxury Restaurant Club offer at Mei Ume. Encapsulating Covent Garden’s heady energy, The Henrietta is a boutique hotel – 18 bedrooms – with the cooking talent of Michelin starred Ollie Dabbous (who has designed the menus) where the menu is ingredient-led with simple, seasonal dishes and a subtle accent of France throughout. Lympstone Manor is a contemporary country house hotel overlooking the Exe Estuary with 21 luxurious guestrooms and suites, a world-class wine cellar, 28 acres of gardens, grounds and parkland. Acclaimed fine dining cuisine is from Chef Patron Michael Caines MBE with his vision of modern British cuisine that is fresh, seasonal, original, utilising the bounty of the Exe Estuary. Perhaps the UK’s finest hotel. Please see Luxury Restaurant Club offer at Lympstone Manor. From the owner of Casa Cruz in Notting Hill, Isabel is another smart choice for a very fashionable crowd. Aside from the setting oozing rich sophistication, the menu comprises of small carb-free but filling (in the main) dishes in a convivial setting of elegant seating around a main central bar. It is open all week for breakfast, lunch and dinner. See the Luxury Restaurant Guide. The venue is a “modern day interpretation of a coffee house” in the daytime and transforms into the exquisite Pike and Pine in the evening. The botanical surroundings, complemented by brass and marble, create an environment perfectly suited to allow diners to fully immerse themselves in the experience of their multi course, seasonal menus, inspired wine selection and creative cocktails. Please see Luxury Restaurant Club offer at Pike and Pine. Situated in the vast grounds of Bruntwood Park, there is no setting quite like Oddfellows On The Park. This brand new hotel set within a beautiful Victorian mansion houses 22 gorgeous bedrooms, a destination restaurant, cocktail bar, flexible event spaces and a statement ‘salon de beaute’ fondly named The Pigsty. The Galloping Major restaurant is situated in what was once the original owner’s ballroom. Huge windows open the room out to the park, bringing the light in and highlighting amazing original features. Please see the Luxury Restaurant Club offer available at The Galloping Major. Traditional homemade Italian cooking meets contemporary London dining with il Pampero, a true Italian gem in Belgravia. Located within The Hari hotel on Chesham Place, the exquisite restaurant is a destination in its own right, attracting local Belgravians and a London crowd looking for a refined eating experience and a vibrant atmosphere. Designed by renowned British designer Tara Bernerd, il Pampero has 58 covers and allows for both table and counter dining. Please see Luxury Restaurant Club offer available at il Pampero. A slick, monochromatic statement setting showcasing sushi, teppanyaki & robata grilled dishes, plus lots of sake from the luxury sushi group – Onodera with locations now in London, Shanghai, Hawaii, Los Angeles and Paris. As you would expect, the quality of the sushi and sashimi is unrivaled. For a truly interactive experience, take a seat at the counter and watch as sensational sashimi is sliced, the freshest seafood is shelled and individual pieces are expertly made to order. Please see Luxury Restaurant Club offer at Ginza Onodera. The Conran restaurant Bibendum relaunched with Claude Bosi at the helm following the closure of the chef’s two-Michelin-starred Hibiscus in Mayfair. It firmly places this iconic art deco building, originally commissioned in 1909 by the Michelin Tyre Company, as their first permanent British headquarters on the map. Please see the Luxury Restaurant Guide. MasterChef: The Professionals 2013 winner Steven Edwards opened his first restaurant, in Hove; serving four, five and eight-course seasonal tasting menus, using local Sussex produce. It encapsulates the casual fine dining culture in its unstuffy and approachable environment with an innovative palette of ingredients and techniques and knowledgeable waiting staff. Please see Luxury Restaurant Club offer at etch. A purpose-built space for cookery classes and dining. The design is open plan; bi-folding doors and glass panelling flood the rooms with light. On any day you’ll find guests and visitors gathering for informal lunches or taking a cookery class, gardeners selecting fresh ingredients or chefs developing menus. It provides an informal dining experience with an open plan layout offering you the chance to watch the chefs at work. The à la carte menu features wood-fired pizzas, gourmet burgers, superfood salads and much more. There is no current offer at The Kitchen but member offers are available with The Luxury Restaurant Club in the main house at Chewton Glen. The Game Bird is a relaxed place to eat for informal dining any time of the day. The focus is on modern British comfort cooking executed with style and panache. Executive Chef, James Durrant has created a menu based on uncomplicated excellence: local, seasonal produce sits alongside time honoured British classics in a setting reminiscent of an exclusive private members club. Please see the Luxury Restaurant Club offer available at Game Bird at The Stafford. Moor Hall is a boutique restaurant with rooms in an idyllic setting to enjoy the delicate, produce driven menus inspired by the exceptional surroundings and talented Chef Patron Mark Birchall. This entry is for the main dining room in the house (The Barn opened later) which is a modern light contemporary dining space. Please see the Luxury Restaurant Guide. Mere is an elegant and contemporary restaurant, offering a relaxed yet refined dining experience. The dishes celebrate the passion and heritage of husband and wife team (and Masterchef judge), Monica and David Galetti, blending classical French with South Pacific influences. The downstairs restaurant has a warm and inviting atmosphere with well-spaced tables and soft lighting while a buzzing upstairs bar is a destination on its own, or ideal for a pre or post dinner hang out. Please see Luxury Restaurant Club offer available at Mere. 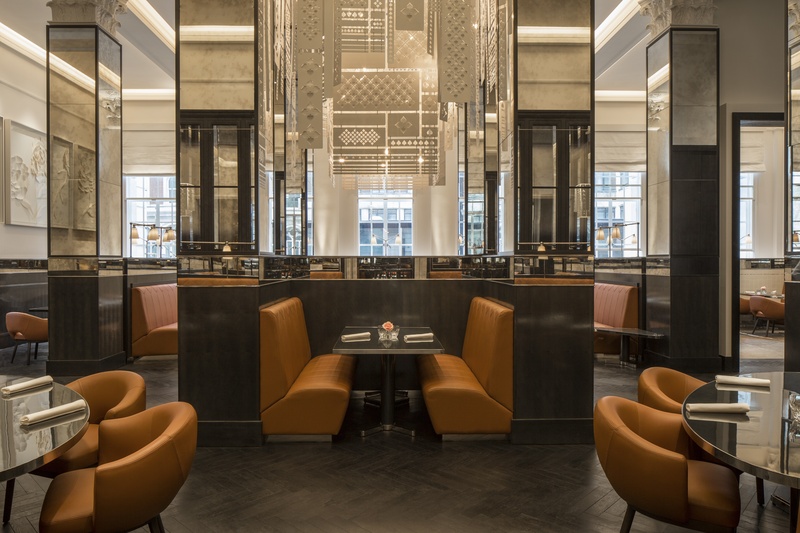 A new culinary landmark in London, Four Seasons Hotel London at Ten Trinity Square hosts the first UK restaurant by Anne-Sophie Pic, the only current French female chef to hold three Michelin stars. Casually elegant, La Dame de Pic London showcases Anne-Sophie’s unique culinary identity with dishes that are rich in powerful and unexpected flavour combinations, complemented by a carefully curated wine list. Please see the Luxury Restaurant Guide. The Finsbury Square branch closed after two years of trading by chef Anna Hansen. The Modern Pantry is part-owned by Des Gunewardena, the founder of D&D London restaurant group. It’s Clerkenwell branch remains fully trading and customers are encouraged to book here instead. No reason has been given for the closure. Mark Hix closed his popular restaurant at the end of its ten year contract term with Brown’s Hotel in Mayfair. Brown’s is due to announce a new and exciting opening at the beginning of the new year following its current guest pop-up of Heinz Beck which is due to conclude after a six week special commission. 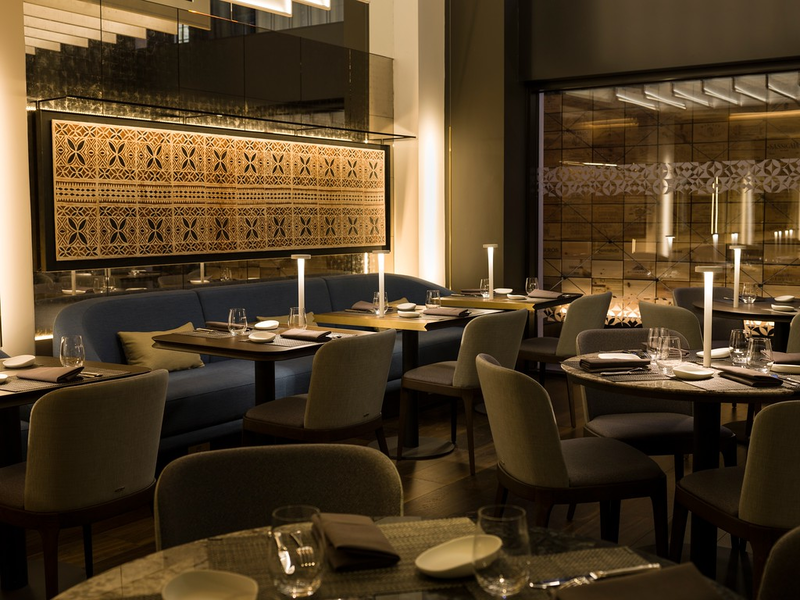 The EC2 based restaurant which opened in 2012 was an outlet for Hakkasan’s Executive Head Chef Chee Hwee to experiment and evolve its tasting menus. It placed the reason for closure down to the need to focus on the groups global expansion. Vineet Bhatia announced its shock closure one week after being awarded its first Michelin star. The restaurant had prior closed when named Rasoi and was Michelin starred. Vineet and his wife had been based at the site in Chelsea since 2004. It is still rumoured the restaurant is to relocate. Ollie Dabbous closed his remarkable restaurant in the summer, brought on by the sale of the site. He is due to open a new restaurant in 2018 and also manages the menu choices and cooks occasionally at Henrietta, the Covent Garden boutique hotel. We were all so excited about the well-documented takeover of the Rib Room by Tom Kerridge, scheduled for late summer. But it never happened as the five star Jumeirah Carlton Towers opened without him and no explanation from either side. That said, the Rib Room continues to be the great destination it has always been since 1961 and we are sure we will hear news soon as a Tom Kerridge foray in London soon. Originally planned to open in 2012 in time for the London Olympics, the billionaire Gerald Chan obviously has big plans for the hotel as he continues to perfect it as a “world beating” hotel. It is now set for launch in late 2018. Merry Christmas to all our Readers. We will be having a one week break over the Christmas period and look forward to bringing you more news in 2018.